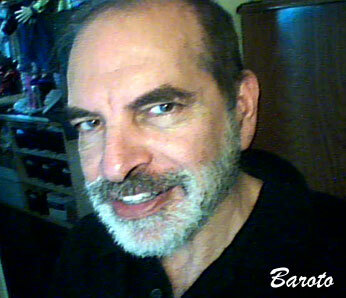 Born in Newark, NJ in 1955, Michael Baroto discovered his passion for Art early in life. It was his curiosity in puppetry however, that would catapult him through most of his career from the New York City stages to the soundstages in Burbank, CA and most recently with the creation of Twenty-Nine Original Fairy Tale Character Marionettes for the Quincy Public Library’s newly constructed Puppet Theater and Literacy Outreach Program, Quincy, IL. As a young Artist, he attended a two-year curriculum at the Newark School of Fine and Industrial Art where he studied Drawing: Technique and Procedure, and in 1968, he was Awarded First Prize in a citywide competition in the UNICEF Poster Award Contest, which resulted in an exhibition at the Newark Museum that same year. He was accepted into Arts High School, in 1969, where he majored in Fine Arts. In addition to his regular curriculum, his studies included Art History, Sculpting, Painting, Portraiture, Design and Figure Drawing and in 1970, he was granted permission to attend a two-year Rutgers University Theatre Arts Program. There he studied Drama, Dance, Promotional Art, Lighting, and Scenic Design. He graduated from Arts High School and was Awarded The Rosamond Hooper Award for Outstanding Achievement in Art in 1972. Michael began his professional career as an artist in New York City, working in various forms of the puppet medium. When he was eighteen, he was hired as an apprentice with the Bil Baird Marionette Theatre, where he worked from 1973-1975. During this tenure, he was promoted to shop foreman. In this capacity he created scenery, costumes and puppets for numerous productions including Pinocchio and Alice in Wonderland. In 1976, while attending several theatrical workshops, he began his free-lance career. He has designed and created Special Costume Effects and Puppets for various entertainment and amusement fields including Radio City Music Hall, where from 1979-1980, he collaborated on six major productions beginning with Walt Disney's Snow White and the Seven Dwarfs. In 1981, he conceived a series of celebrity caricature sculptures and received the first New York exposure of that work out of the Bergdorf Goodman Salon, on Fifth Avenue, December 1982. In 1983, Michael decided to relocate to Los Angeles in order to pursue a career with the Motion Picture Television Arts and Science Industry. While enrolled as a full time Business Administration student he studied courses in Business Law and Accounting. The Sid & Marty Krofft Company subsequently hired him in 1984, as a puppet designer and later that year received the first major exhibit of his work out of the Molly Barnes Gallery in Los Angeles. Hired by NBC Studios in 1985, He was accepted into the Motion Picture Costumer Union in 1986-1993. While continuing to create for NBC, Michael began marketing his skills to a wider audience in 1987. He has designed and created Special Costume Effects and Puppets for NBC, CBS, PARAMOUNT, UNIVERSAL, DISNEYLAND and MATTEL. In 1990, he began to study the field of Animation and Children's Literature. He has taken courses in Writing for Animation, Introduction to the Art, and Basic Animation Mechanics, however the creative focus of his work began to shift toward Children's Literature and by the end of 1992, he returned to the east coast to develop his talents as a Children's Book Illustrator. While on the east coast he launched his own mail order company Spectacular Dimensions, 1993 and created the first mail order Puppet Parts online catalog for cast rubber puppet parts and services.